Automatically commenting in a list of Instagram Posts can be useful in some cases. At Phantombuster we believe good content and real connection with your followers or influencers is key. But that doesn't mean that used in a creative way or for exceptional reasons an auto-commenter tool can be really useful in automating part of your Instagram strategy. Like any auto-comment tool, you'll have the possibility of writing numerous comments which will be published ramdomly on each post. 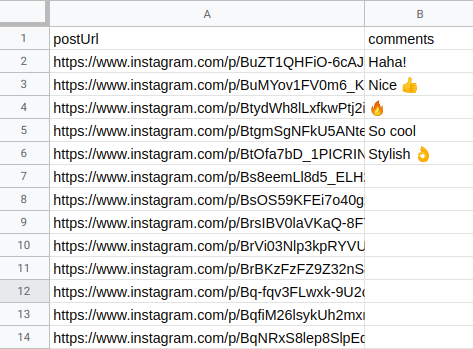 Spreadsheet URL: The link of a Google Spreadsheet with Instagram posts URLs in one column, a list of messages in another column. Comments: A list of comments that will be published automatically at randon on the posts specified in the spreadsgeet above. Don't use emojis as most of them aren't handled. 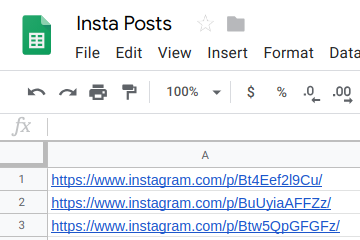 Your spreadsheet should contain a list of Instagram Posts URLs (one link per row). You can specify the name of the column that contains the post links. Simply enter the column name in the next text field. You can also enter a single Instagram post URL directly in the field. You'll need to specify a list of comments in your input spreadsheet. To do so, choose an empty column, name it (by writing comments for example in the first row of the column). Then on the rows belows, write each comment, one by line. Once you're done, get back to Phantombuster and let it know how you called that column. Ready? Now click on "launch" to try your script! 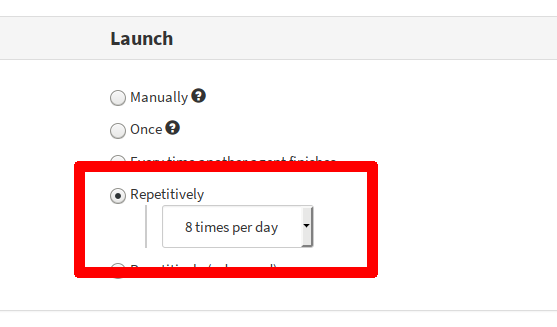 Once your automation is fully set up, you can program repetitive launches. That way, your auto-commenting will be spread over days, weeks or even months.